The following is taken from a short address I gave as part of the memorial service for John O’Donohue, which was held in Galway on Saturday 2nd February 2008. 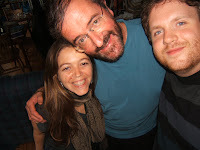 The photo to the right is of two pilgrims with the beautiful John, in September 2007. ‘I think I’m beginning to become involved’. At the time he was referring only to a speaking engagement, but little did I know that he was also going to become involved in my life as a beloved friend, one of the most life-enhancing people I’ve ever known, and a man so in touch with his real self that his goodness was always on the surface, no matter what was going on in his life. The last time I spent a day alone with him was in July last year, in this very city, beginning only a few hundred yards from where I stand right now. We had arranged to meet on a Sunday evening, but by 9 o’clock that morning I was experiencing an attack of anxiety and depression, no rare thing for a writer, but all I wanted to do was to go home and be alone in my own space. When I rang John to cancel our evening, he happened to be on the outskirts of the city, and he insisted that we at least meet for 15 minutes. We found ourselves at the McDonalds restaurant car park by the Omniplex cinema – a place which ordinarily I would not consider sacred territory, but now I believe proves John’s assertion that everything can be holy. He bought me both an orange juice and a coffee, invoking his notorious over-reliance on quoting advertisements for L’Oreal haircare products, and telling me he’d get me both ‘because you’re worth it’. I think you’ll agree that it is a far better deal to be depressed with John O’Donohue than to be depressed on your own. and so, even though his day was busy, we spent the next 24 hours together, as I went with him to the anniversary mass he celebrated for an old friend, and onto his home at Gleann Treasna, where we talked about depression and anxiety, and I felt the healing balm of his friendship over cigars and whiskey by the fire. I cooked him dinner, and we ate as a spectacular burnt orange sun went down. After dinner, we watched the Coen Brothers’ deliriously funny and smart film version of Homer’s Odyssey ‘O Brother Where Art Thou?’, and laughed the kind of deep laughter that comes only when friends have let their guard down. After the movie, he hugged me goodnight, and I went to sleep on his profoundly uncomfortable sofa. In the morning, he made me porridge and coffee, and then I drove back to Belfast, filled with a sense of well-being, and with insights into my own life that still reverberate in me today, but most of all, with the knowledge of the love of my beloved friend. Several years ago, John O’Donohue said to me, ‘I think I’m beginning to become involved’, and it is one of the richest blessings and deepest privileges of my life to acknowledge here today that, for those of us whom he loved, he is still involved.